Heat a nonstick frying pan over medium heat. Add the oil and wipe out any excess with a paper towel. Add the mushrooms, cook for 5 minutes, stirring often, and remove from pan and set aside. Add the onion and cook until brown, about 5 minutes. Add the chicken and cook until brown, about 6 minutes. 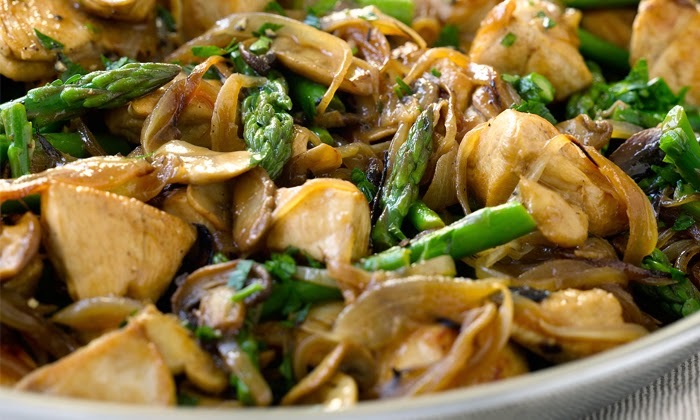 Add the asparagus, cooked mushrooms, lemon juice, and parsley, along with salt and pepper to taste. Reduce the heat, cover, and continue cooking 10 minutes.